Once upon the time there was a kingdom called Soccer land, and its king was the best soccer player that had ever kicked a ball: the king Pelé. His kingdom was so powerful that it ruled entire countries, such as Brazil. Over there life was different, it flowed like the rhythm of Samba. Soccer was reinvented daily with creativity and without excuses. The ball could be made out of socks, the distance between two flip-flops could become the goalpost and the field could be any empty space. The only thing that never changed was the owner of the crown. Pelé could not come from another country and neither could I! Pelé does not need an introduction; however, I do! 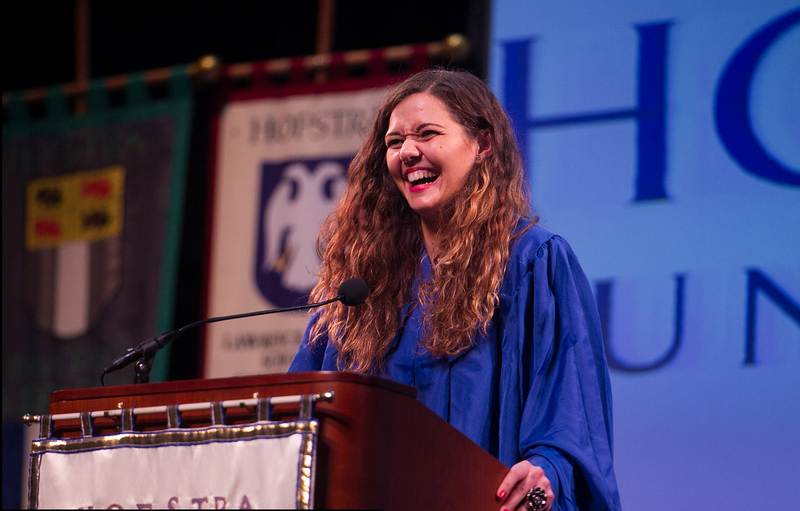 My name is Sara, a Brazilian volleyball player graduating from Hofstra next month. For those who are not familiar with Brazilian customs, it is common to receive a soccer ball as one of your first gifts. As a child, your first steps would be chasing a soccer ball while holding your parent’s hands. Of course, every tradition has exceptions... But I was not one of them! I grew up playing soccer against my dad in the garage of my house, and in there was the first time that I heard about Pelé. My dad told me about the World Cup titles that Pelé won, about his gingado (fun way to play with the ball), dribbles, and all the stories about the owner of the yellow number 10 jersey. Pelé sounded so exciting to me that I even thought he was the man who created soccer. Indeed, he may not be the inventor, but he is definitely the genius responsible with lighting up the soccer pride inside all of the Brazilians. Well, if you are not convinced yet… He won his first World Cup at the age of seventeen! Just think of what you were doing at this age. I doubt it would be getting ready to win a World Cup! When I found out that the king was coming to Hofstra to receive his honorary degree, I was very excited; I knew that I was in the right place at the right moment! A few weeks later, the news got even better. I received an invitation from the organizers of the event, Dr. Stanislao Pugliese and Dr. Brenda Elsey. 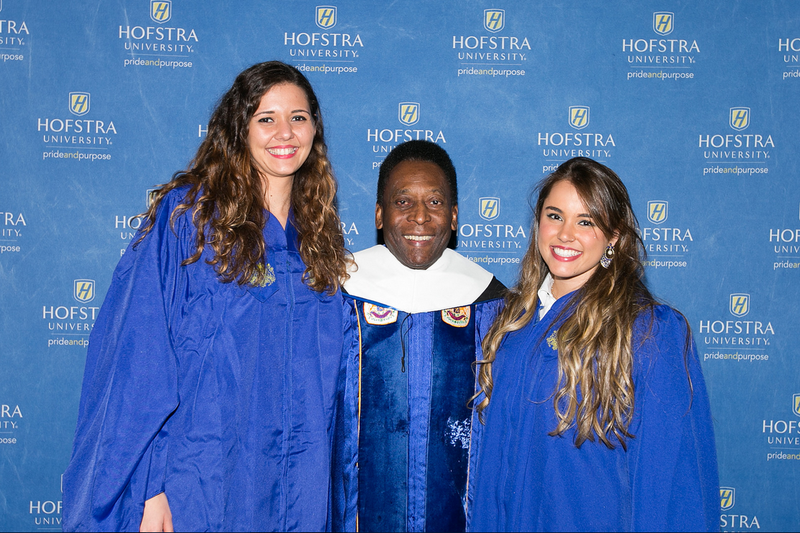 They were asking me to introduce Pelé at the ceremony! It took me a while to realize what was about to happen. The organizers also asked me about my friend Hannah Gomes, a Brazilian freshman studying pre-Med at Hofstra, and it instantly gave me a good feeling by knowing that she would be sharing the pressure of representing Brazil on the stage with me. When we met for the first time after we had received the news, we simultaneously asked each other, “What are you going to wear?” The solution for our girl problem came from the organizers, when they told us that we were going to wear robes over our clothes. It was not fashionable, but it definitely was very useful to hide the sweat when we shook hands with Pelé backstage. Then we asked each other what we were going to say; however, the answer for this question took us a long time and a few drafts until we finally figured it out, while dealing with the problem of being foreign students. Indeed, the only thing that was not questionable was the excitement of meeting the legend Pelé! We waited anxiously for April 11 and our Cinderella Day finally came. It was an experience of a lifetime and the proof is in the selfie that I took with him, along with Hannah’s autographed Brazilian national team jersey. We needed this to prove even to ourselves that it had really happened. For those who listened to my speech, the adoption papers are still being processed (for Pelé to adopt me), but for now I am still a happy Brazilian orphan!